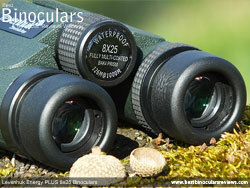 As with many compacts within this price range, I assume the objective with these Levenhuk Energy Plus 8x25 binoculars is to produce a small and lightweight as well as low cost binocular that performs both optically and physically to a reasonably high level so that they can be taken almost anywhere and used effectively in a large variety of conditions. So for example almost everyone wants their bin to deliver a high quality as well as bright image. To achieve this you have to firstly capture as much light as possible, to do this you need to increase the size of the objective lenses, which adds size, weight and to a certain extent cost to the device. 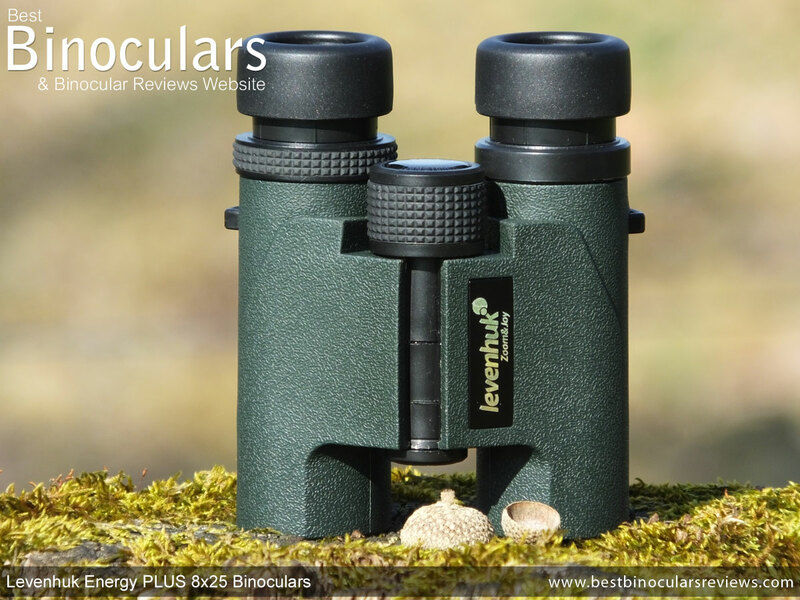 Which as you can imagine is not ideal if you are trying to produce a lightweight and small device like these Levenhuk Energy Plus 8x25 binoculars. Then to ensure that you realize the potential of this captured light, you need to maximize the amount of light that passes through the optical system and into your eyes as well as ensuring that it follows an exacting path so as to avoid any or as much distortions as possible. To achieve these objectives you need to use very high quality glass in the lenses and prisms as well as a range of very specialized coatings on these glass components. The better the glass and coatings you use, the better quality and brighter the image you get, but this once again, the better the quality components, the higher the cost. 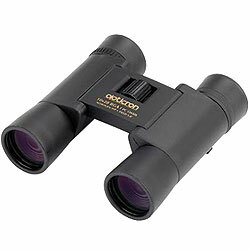 Likewise many people want a very high magnification so that they can get as "close" to the subject as possible. However by increasing the magnification you will reduce the field of view making it harder to locate the object and the higher power, the harder it is to keep the image still. 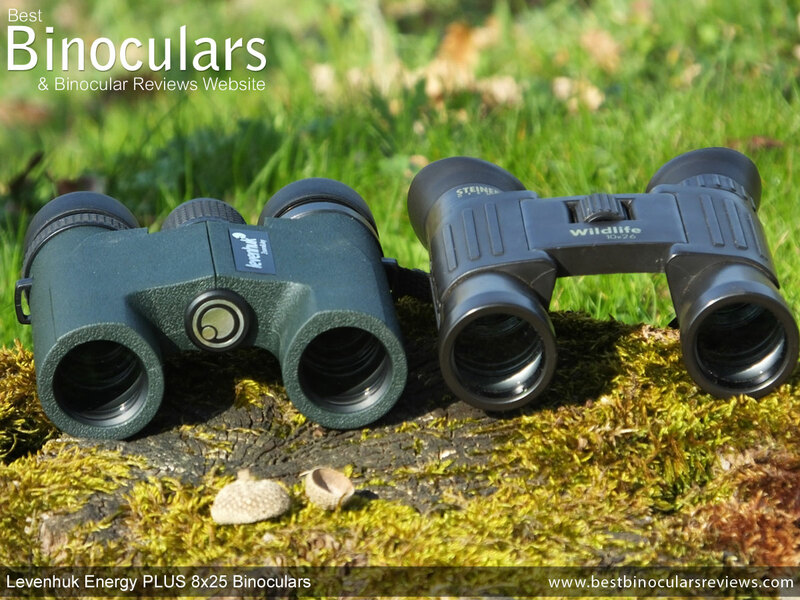 High powered binoculars also transmit less light to your eyes because of the smaller exit-pupil and the need to use thicker glass and so the image becomes less and less bright the higher the magnification gets (assuming the same size objective lenses) . 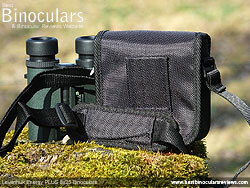 For a roof prism compact the overall design of these Levenhuk Energy PLUS binoculars is very typical. 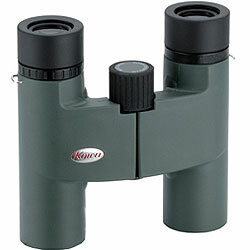 As you would expect the objective lenses are in-line with the eyepieces (unlike the stepped eyepieces on porro prism compacts) and they have a single centrally located hinge that you can open and close and thus change the distance between the eye-pieces to equal that of your eyes (for more on this see IPD below). This now classic shape, with their large focus wheel makes them in general nice and comfortable to hold as well as use no matter if you have small or large hands and yet are still fairly compact compared to other designs. 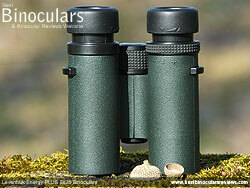 Almost the entire shell on these Levenhuk binoculars has been covered in a rubber armour. This covering as the name suggests is largely designed to protect the device by dampening the shock from impacts, however as the covering on these is made from a comparatively hard rubber the amount of dampening protection will not be as much as on those that have a softer, more spongy covering. On the flip side less dirt and dust collects on this harder rubber and it will most certainly be more durable and last longer without perishing. On top of the protection aspect, this rubber coating also brings with it a number of other benefits. This includes offering more grip than than you would otherwise get from a the hard and smooth shell underneath, although once again because it is quite hard this effect is not as great as those with a soft rubber coating. The rubber also acts as a sound dampener and is not as shiny as exposed plastic or metal and thus is less reflective, both of which help to keep you from exposing your position or prevent you from accidentally frightening away birds and other wildlife. Important features for some birders, hunters and especially on some walking safaris where even the slightest noise can potentially ruin a once in a lifetime sighting. Levenhuk describe the "shell" as being made from "shockproof plastic", which I will take to mean that they are made like most in this price range from a polycarbonate plastic. Whilst I won't deny that I prefer a magnesium or aluminium shell, plastic ones do have some advantages apart from being cheaper to make, they are generally lighter and whilst they may not be quite as luxurious or as tough as the more exotic materials, if well made they are generally strong enough to easily cope with most normal day to day bumps and knocks. 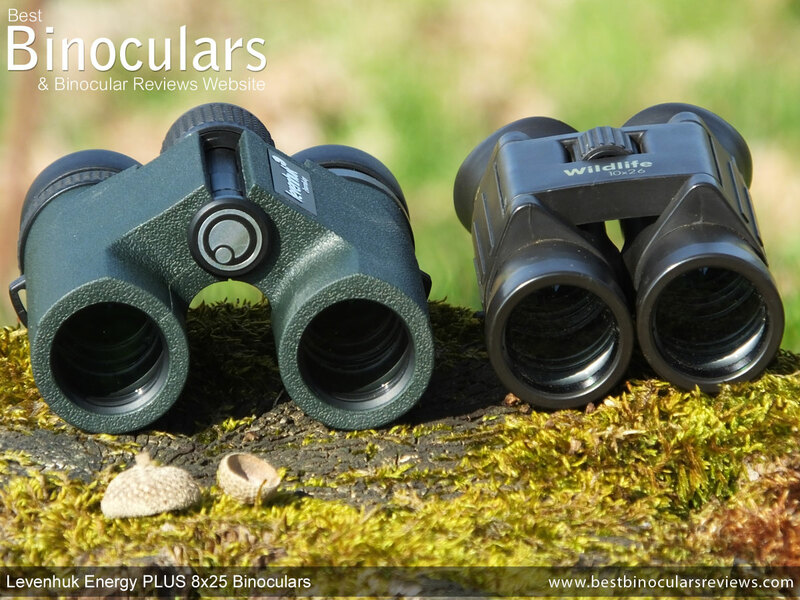 The bodies on the Levenhuk Energy Plus binoculars are completely sealed making them waterproof and whilst they do not specify a recognized standard they do go on to say that they are completely waterproof to a depth of 3 feet for one minute. Remember a fully sealed shell also prevents small particles from entering the instrument, which can be every bit as important tin dry and dusty locations. By removing all internal air and replacing it with a dry gas (probably nitrogen) during the manufacturing process, the internal optics are also protected from fogging up which often occur to unprotected devices when you get a rapid temperature change. To adjust the eye-cups to equal the distance between your two eyes, as with almost all bins, you simply open and close the hinge on the Energy PLUS. 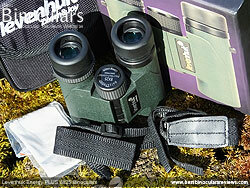 The minimum IPD that can be achieved with these is 5.7cm and the maximum is 7.1cm. Whilst the minimum is a little way off from being the closest I have seen, this range is fairly standard and should be sufficient for the vast majority of people out there including children as well as some women who sometimes have eyes set a little closer than your average adult male. With a diameter of 27 millimeters and being 20 millimeters wide, I would describe the centrally located focus wheel as large for a compact binocular, indeed it is almost the same size as some I have see on full sized binoculars. This larger size, along with the deeply deeply grooved rubber track that runs around it, makes it nice and easy to find, reach and turn (even whilst wearing winter gloves). So whilst it does help with the overall dimensions or weight of the instrument, it is in my opinion a big improvement on the sometimes tiny wheels found on many compacts that can be quite difficult to accurately operate, especially if you have large hands or with gloves on. The body of the wheel looks to me to be made from the same plastic as the rest of the body and whilst this may not exude the same level of class or be as tough as metal ones, the action was nice and smooth, without any free play or sticky points taking it from the extremes of close focus right through to infinity. Speaking of which, it only takes about ¾ of a turn (270°) of the wheel to go from one extreme of the focusing plane to the other. This relatively very little amount of turning makes it far quicker to change the focus over larger distances, but some may find it a little more difficult to finely tune the focus, however I never had any problems getting the focus spot on whilst testing and using them. The diopter adjustment wheel is located in the usual position near the right eye-piece and for those who don't know is used to independently adjust the focus the right ocular from the left. In this way you can calibrate the bin to allow for any differences between the vision in your right and left eyes. This calibration only really needs to be done once when you first set up the instrument, or if you share them with someone else who has different vision to yours. 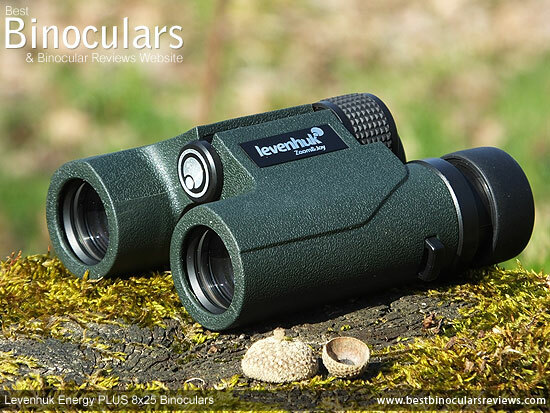 So unfortunately unlike the best ones, the diopter on this Levenhuk binocular is not lockable, but it does have a good amount of resistance to movement, making it easy enough to turn when you mean to, but should not move that easily by accident. Another small omission for me is the lack of markings or a scale. Sure there is the central point marker, but if your setting happens to be anything other than this, there is no way of quickly locating that exact point again unless you use a permanent marker or perhaps a making a small nick with a knife to make a mark. 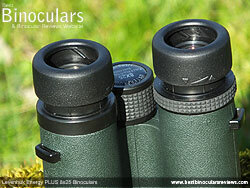 All models within the Energy Plus series, including this 8x25 version come with twist-up eyecups. Whist the cup itself and the housing look to be made from plastic which is probably less lightly to survive a large impact as metal ones, for a compact in this price range this what I would expect to find. Besides in my opinion, a plastic twist-up eyecup is almost always preferable to the simple fold-down rubber eyecups that are also commonly found on compacts as long it is well made and works well. Speaking of which, the ones on my sample Levenhuk's did work well and had a nice smooth action and I did not detect any looseness or free play. 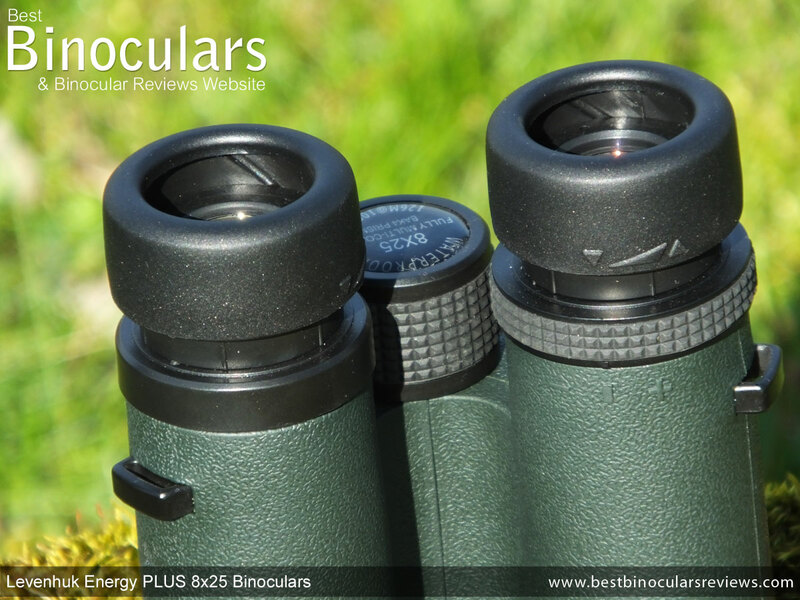 They have a fixed stop located half way between being completely extended and retracted, which adds a bit more flexibility when adjusting them so that you can get your eyes positioned at the perfect distance behind the ocular lenses so as to get the full field of view. The eye-relief of 14mm is about average for a compact bin, a few have more and many have less (especially those with fold-down cups), so this should just be fine for most people and no problem at all if you do not use your bins whilst wearing glasses. However should you need your glasses, I usually recommend an eye-relief of 16mm or more. So depending on the shape of you glasses and indeed your face, this may be an issue. As I don't wear glasses, I tested them whilst wearing my sunglasses and by fully twisting-down the eyecup, I was just able to get to see the full view without any dark rings and the side, so for me these were just acceptable. The cups themselves are coated in a thick black rubber and whilst it is quite hard, the external diameter of 36mm is nice and wide and I never had an issue with comfort. At 13ozs (369g), you can see from the table below that lists a number of other similar sized bins, these are far from being the lightest compacts out there. However they do feel solid and nicely balanced, so unless you are a minimalist hiker or trying to reduce weight as much as possible for another reason, I would not worry too much about the extra 50 or so grams that these weigh as they are still far lighter than most mid or full sized bins. 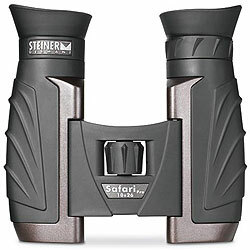 Once again if you refer to the table above and the first photo below that compares them to a pair of Steiner Wildlife 10x26 binoculars, you can se that their dimensions with the central hinge open are fairly standard for a compact binocular. However these and other single hinge roof prism compacts do not really compete when it comes to size with the design of the double hinged compacts when folded, which for me is when you really need them to be as small as possible. 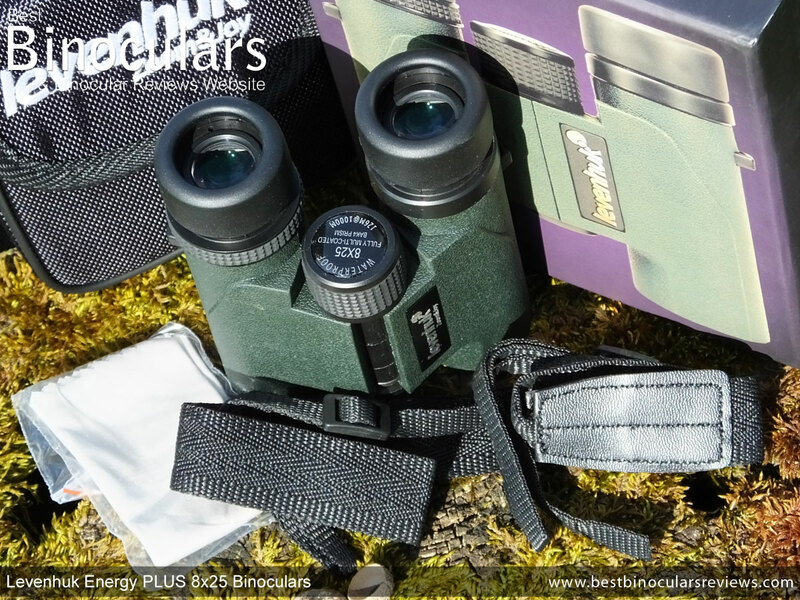 As the photos above clearly demonstrate, whilst open (when you are using them) these sing hinged Levenhuk 8x25 Energy Plus binoculars are very similar in size to that of the double hinged Steiner 10x26 Wildlife's. It is when you fold them up and want to put them away that the double hinges produce a far smaller shape that makes it more possible for you to place them in a small bag or even your shirt pocket. Now if you always hang your bins around your neck when not in use, this will be no issue at all, but if like me you do not always want them swinging about and would rather place them in your pocket, unless you have a larger jacket pocket this may be an issue. A simple way around this potential problem (apart from getting clothes with large pockets!) is to attach the carry case to your belt using the belt loop on the back of it and simply place the bins in the case which will now be conveniently positioned on your hip (see the accessories section below for more details on the carry case). If you would rather a double hinged compact take a look at this article on the best compact pocket binoculars where I list a few others I have reviewed. As is indicated by their shape where the ocular and objective lenses are in a straight line, these and all other Levenhuk Energy Plus binoculars in the series have roof prisms inside them to correct the inverted image. 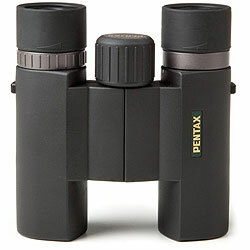 Levenhuk have used good quality BaK-4 glass that ensures less of the peripheral light is lost caused by non-total internal reflection and so can produce a brighter, higher quality view than those that use lesser quality glass or BK7 glass prisms (which is reasonably common within this lower price range) that has a lower refractive index and thus more light is lost. Whilst I have not been able to find out any information on their exact makeup, the 18mm diameter ocular lenses on these Levenhuk's are comparatively large for a compact bin. So the exit-pupil created by any 8x25mm bin will be 3.125mm in diameter (25 ÷ 8 = 3.125), whilst a smaller compact, let's say an 8x20mm will only produce a 2.5mm exit pupil (20 ÷ 8 = 2.5). During the day and in good light, the pupils in most people eyes will probably be dilated to a diameter of about 2 - 4mm. So whilst an 8x20 binocular may be smaller and probably lighter, the smaller exit pupil will be more of a limiting factor and seem less bright than the 8x25 bin that is delivering more light to your eyes. This difference will be come more evident the poorer the quality of the light gets and the larger the pupils in your eyes dilate. This is why if you really need a bin that performs well in low light, you need to sacrifice size and weight and choose a bin with larger objective lenses. To ensure as much light as possible gets through the optical system to your eyes, manufacturers will often add a number of special anti-reflection coatings to some or all the glass surfaces that lessen the amount of light that gets reflected away or in the wrong direction. 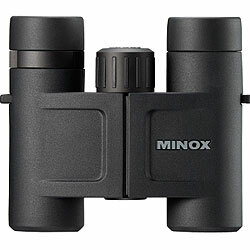 Apart from doing nothing, these cheapest option is to only add a single coating to some of the glass surfaces, these "Coated" binoculars are often found in the very cheap category. Next cheapest for the manufacturer is to add multiple layers of the anti-reflection material, but still only to some, not all glass surfaces - usually the outer lens surfaces. 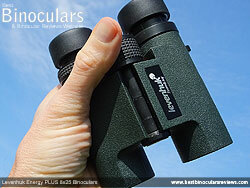 These "Multi-Coated" optics are often found within this price range and whilst they will perform better than single coated optics, they are not as effective as "Fully Multi-Coated" products like these Levenhuk Energy Plus binoculars that contain multiple coatings on ALL glass surfaces throughout the optical system. So whilst they may cost more to produce which is why you don't always find it in this class, the result is far less light being reflected away and thus a brighter, better quality image is possible. Other than mentioning that they are made from BaK-4 glass and to say that the optics are fully multi-coated, Levenhuk do not offer any information as to if the prism is phase corrected or if or what highly reflective coating is added to the one surface of the roof prism that does not reflect all the light that arrives at that surface, so I can't comment. For scoring purposes, I will assume that they like many bins in this price range don't have phase correction coatings and have an aluminum mirror coating which is much better than nothing, but does not reflect as much as the far more expensive silver or dielectric coatings that you get on high end bins. 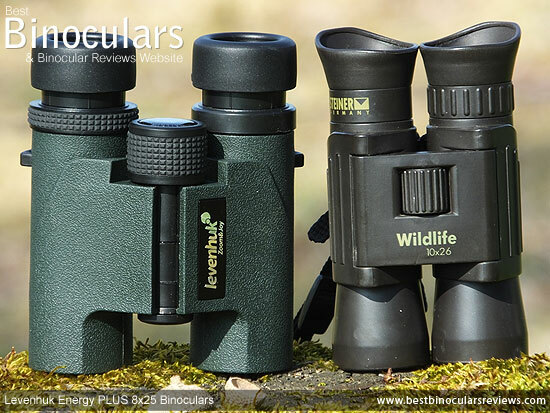 When you look through these Levenhuk Energy PLUS 8x25 binoculars at a distance of 1,000 yards, the view is 378ft wide (126m at 1,000 meters), which for an 8x compact is REALLY excellent and up there with the widest FOV's on an 8x compact that I have ever seen, even beating the superb and far more expensive Swarovski CL pocket bins (see table below). 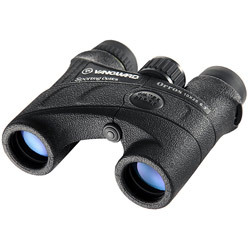 This exceptional FOV makes it easier to quickly and more easily locate whatever it is you want to observe (especially at closer distances) and in the case of things like fast moving and sometimes erratic birds, much easier to follow. A wide FOV also makes them good for scanning over wide areas whilst searching for something. With a wide FOV you also see more of what is happening at once without having to scan about, an important attribute for many uses, but especially for watching sports like motorsports, tennis, cricket, rugby, football, baseball and even sailing. 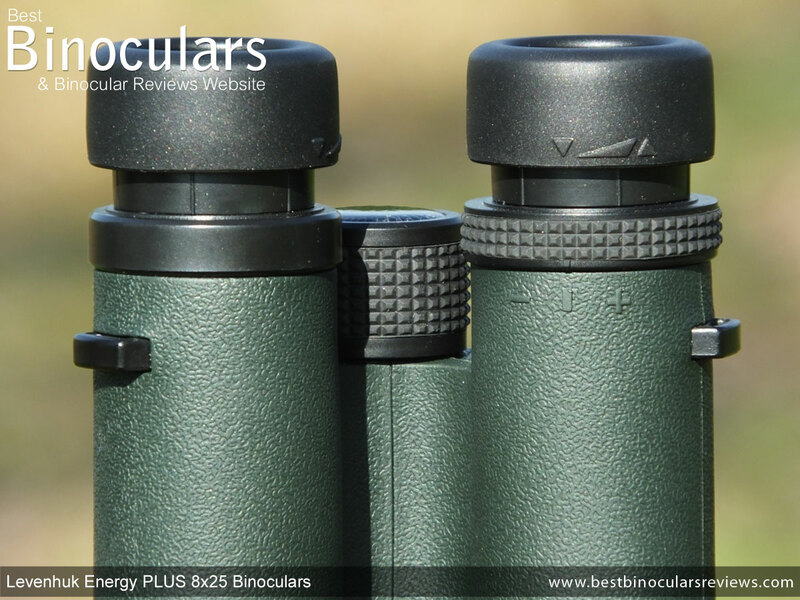 The official close focus on the Levenhuk 8x25 Energy PLUS is 6.6ft (2m), which I can confirm after measuring my test pair as being accurate. This distance is good but not excellent for a compact and so I would say that for occasionally looking at butterflies, dragonflies, other insects and flowers these are more than fine, but if this is your main intended use for them, you will be better off with something like the Pentax Papilio 8.5x21 binocular that has a close focus distance of only 1.6ft! You do pay for the exceptional wide FOV and good close focus however and this means that their eye-relief at 14mm is a little on the short side. As I have already gone over in the eye-cup section above, for most people this will not be an issue at all, but if you wear glasses, especially larger thicker ones whilst glassing this may be a deal breaker. To be as objective as possible when judging the aspects of the view through these Levenhuk 8x25 Energy PLUS binoculars, I compared them against my 8x and 10x26 controls which I use for all my reviews of similar sized compacts which I use as controls. I thought that the image produced looked natural and reasonably vivid, what I mean by this is that I could not distinguish any tinting of the image that you occasionally get, especially on cheaper products like this. Contrast was also very natural looking with a nice variance between light and dark. This really helps create a sense of depth and makes objects like birds stand out nicely from their backgrounds, especially when located in thick bushes or trees. 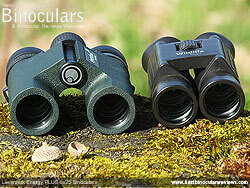 A certain amount of color fringing is observable in almost all binoculars that I have ever reviewed. It is the result of chromatic aberrations where the lenses are not able to focus all the different wavelengths back onto exactly the same focal plane. To help minimize this, lens makers will often use a range of special glasses including ED (Extra Low Dispersion Glass) glass. I thought that the amount of color fringing that I saw through these Levenhuk's (even under extremes like looking at the edges of dark objects against a bright sky background) was perfectly acceptable and better than most at this level and I would say on a par with many mid level compacts. So whilst these, like almost all compacts especially those at this price point do not contain ED glass, the designers have still done a good job in combining the lens elements in such a way so as to curtail this aberration. To me the observable image looks perfectly flat, right across the field of view and I could not notice any curving inwards or outwards of the image that I notice from time to time. Whilst present, the softening of the image right at the edges of the view is very minimal and I would say is about as good as it gets within this level. In these conditions the image brightness looked to me to be equal between these and my 8x and 10x26 compacts, which is pretty much as I would expect considering that all would have been supplying my eyes with enough light in these conditions and these Levenhuk's should have a pretty good transmittance level with their full multi-coated optics. It was in very bad light that I could observe that these and my 8x26 controls were a fraction brighter than my 10x26 controls. This is as expected and more down to the different sizes of the exit-pupils and the size of the pupils in your eyes in these conditions. 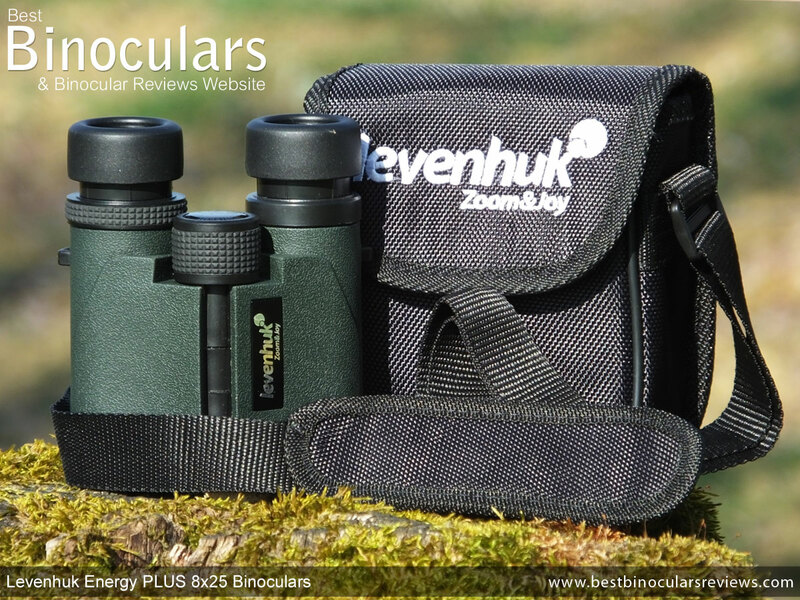 This leads me to conclude that these 8x25 Levenhuk Energy PLUS binoculars, whilst not quite matching the best, are as bright as the better quality compacts and surely an improvement on really cheap compacts with lesser quality glass and coatings than these. The small carry case is generally very good for a bin in this class very good. The amount of padding is not huge, but will be enough to protect the optics from everything but the largest whacks and bumps. The bins fit snugly within the case, but not too tightly and you can still close the lid with the eyecups extended, which is good as this is a small detail many makers forget. The case comes with it's own nylon strap that can be adjusted for length and has a lightly padded shoulder slider for added comfort. Should you not wish to carry it on your shoulder, you can also thread your belt through the loop on the back and carry it on your hip. The simple flap lid is held closed with a strip of Velcro and whilst this makes for very quick access, you may need to be careful not to make too much noise whilst doing it in certain circumstances should you not want to startle wildlife or give your location away. Inside the case there is also an elasticated pocket, ideal for keeping lens cloths and a few small personal items se per ate from the bins. The black nylon neck strap is basic, does not contain any logos, is 2.5cm wide on the part that goes around your neck, does not contain any padding and is not shaped to fit around you neck and shoulders as some of the better ones are. However having said that almost all compacts, especially within this price level have very similar and rather simple straps. Whilst it would have been nice, a padded one would possibly be a little overkill for such a small and lightweight device anyway. 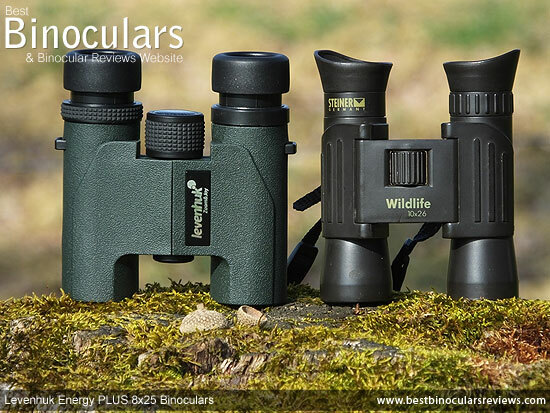 The connection between the thicker neck part of the strap and the thin cords that you thread through the loops on the binocular is made from a fake leather and whilst also very simple, the stitching looks to be strong and should last. The strap connects to the bin in the usual way by threading it through the loops on the side of the bin and then back on itself and through a slider which you can use to adjust the length. 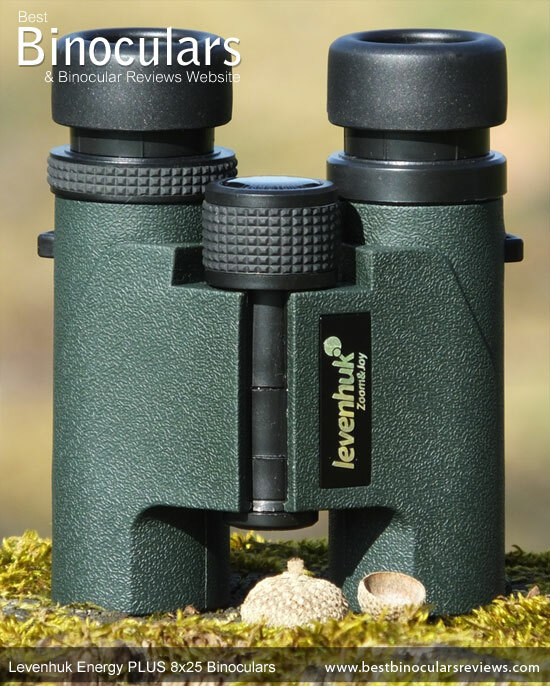 These Levenhuk's are not supplied with objective or ocular lens covers and whilst this is not uncommon for a compact binocular, I still feel that it is a slight shame for those of us who don't like to return the binocular to it's case after every use. 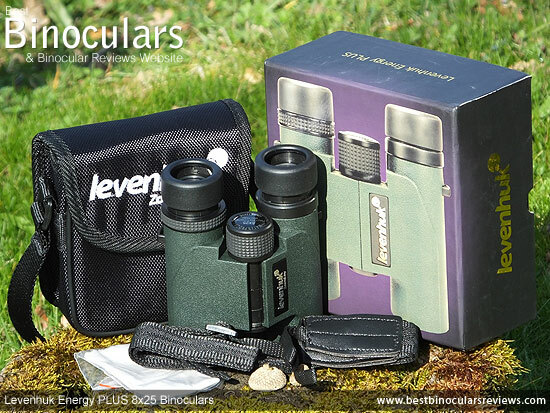 Levenhuk Optics include a decent quality cleaning cloth with the bin. Whilst this will be fine for cleaning the body and perhaps emergency cleaning of the lenses when out in the field, I would still get myself a proper optical lens cleaning kit to properly look after the lenses. The included user manual comes in the form of a booklet and like most at first it looks really substantial, but is written in a number of languages. 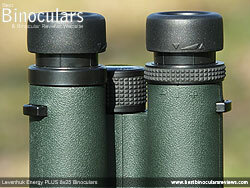 This one is also generic and the same one is used for all binos in the Energy PLUS series. However the most important information like how to focus, diopter adjustment, care and maintenance is covered. There is also a table which covers the main specifications on all bins in the series. 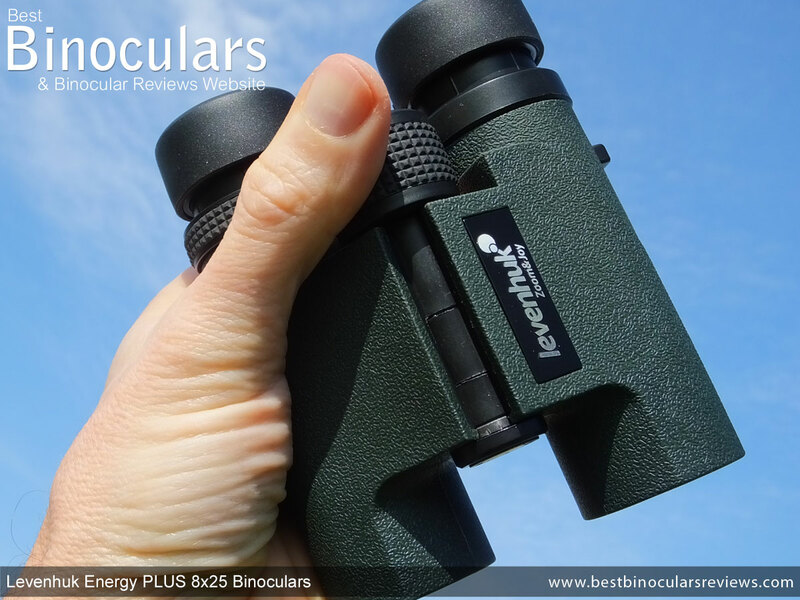 As with all Levenhuk binoculars, telescopes, microscopes and other optical products (except for accessories) these Energy PLUSS bins come with a lifetime warranty which is excellent. 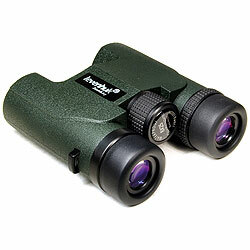 Within their price range, I would say that their build quality and use of materials and coatings is good. The fully sealed body and fogproof optics is not always a given in this class and the fact that the optics on the Levenhuk Energy PLUS 8x25 binoculars are fully multi-coated is, at this price level, excellent. Their very wide field of view is exceptional for an 8x bin of this size and their close focus distance is also as good as the better general use compacts out there. I liked the feel of them in my hands and the large focus wheel was nice and easy to reach and turn very accurately, even whilst wearing gloves - something that is quite not often the case with compacts. The fairly short 14mm of eye-relief will be a concern to those who use glasses whilst binning and it is a shame that they don't come supplied with some sort of lens covers even though this is a fairly common practice for compacts. 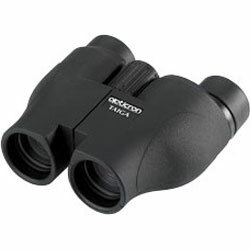 Whilst they are as small as most compacts when in use, the single hinge design means they can never quite be called a pocket binocular and match the compactness when folded up as double hinge compact bins. 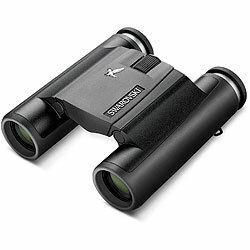 If comparing them to top tier, expensive compacts, you would say that the use of materials like their polycarbonate shell and eye-cup housing are weaknesses, but at this price, I have yet to come across a bin with a magnesium chassis and metal eye-cups, so within their class this is perfectly normal. Ideal For: As with almost all compacts these Levenhuk's are a good choice for pursuits where a small size is an advantage like hiking and camping. Being able to easily pack them away also makes them a great low cost option on holidays like a safari or even a skiing trip, where their large focus wheel means that they can easily be used with thick gloves on. 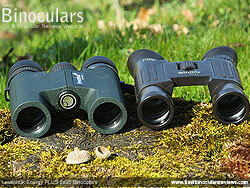 Their super wide field of view makes them even better than most as a inexpensive, small birding binocular and for me are an ideal outdoor sports binocular, but especially for motor sports, football, baseball, horse racing, cricket, tennis and for watching sailing or surfing, where you will be able to more easily follow what is going on by simply seeing more of the action at once. Due to their lower cost, a large easy to use focus wheel, moderate 8x power making it easy to keep the image still and especially because the they are quite small and lightweight, with a fairly close minimum interpupillary distance setting, I also have no hesitation is recommending them as an ideal option for an older child or teenager. 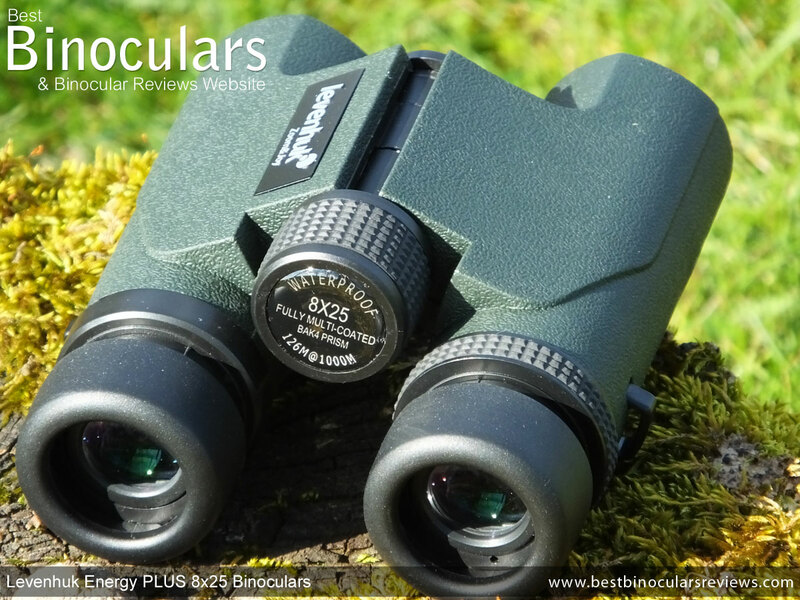 I come across many binocular reviews that to me look like nothing more than adverts written someone who has never even seen or used the bin under test. 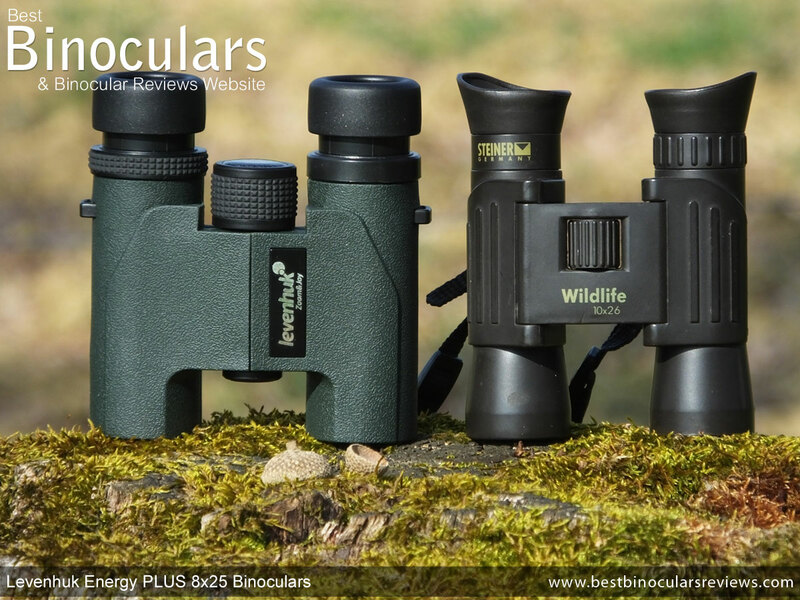 I would like to reassure you that this Levenhuk Energy PLUS 8x25 binocular review is my honest opinion of them, written after I had thoroughly, researched, used, tested and compared them to other similar products. I would also like to make it clear that I have not been compensated in any way or asked to write in a particular way for this or any other review on BBR.